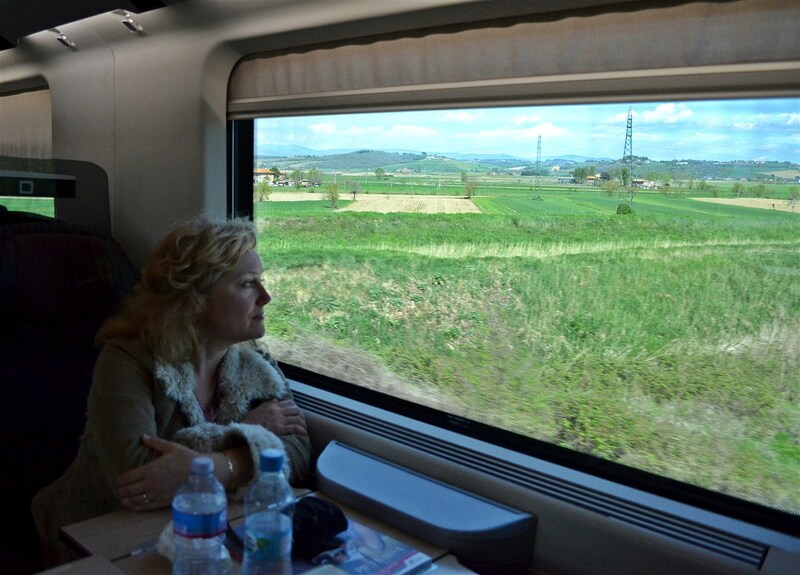 After our stay in Rome, we left the Eternal City from the Termini railway station aboard one of Trenitalia’s high speed “bullet” trains headed for Florence, or Firenze, as the natives would say. I’ve loved rail travel all my life but this was my first experience traveling on the high speed variety. I was of two minds beforehand about doing this. Getting from Rome to Florence in ninety minutes sounded great, but I was afraid of missing something, that perhaps the speed would cause it all to be a big blur rushing by us. Topping out around 150 miles per hour, this seemed a distinct possibility. After all, part of what I love about trains, the romance if you will, is watching the countryside roll by at a pace where you can take it in and really see the land, with the added advantage of not having to pay attention to my driving like when auto touring. As it turns out, I needn’t have worried. Irina and I both loved the bullet train. It’s smoother than glass, extremely comfortable and while I wished that some of the picturesque Tuscan countryside might have passed a bit more slowly, it definitely was not a blur. I actually wanted the ride to last a little longer, not something I say often when traveling. 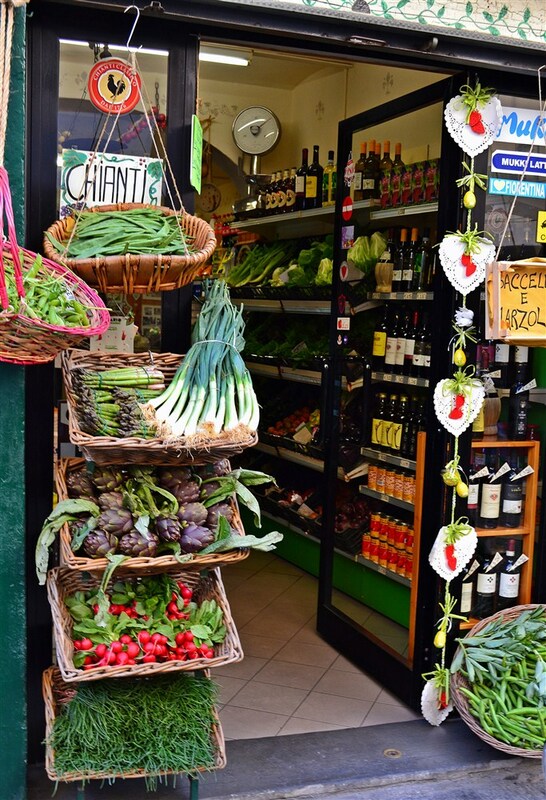 Next thing we knew, we were in Florence, and to be in Florence is to find yourself a slice of heaven. No, not a slice. More like a full-sized, mouth-watering, soul-filling banquet of Italian bliss. 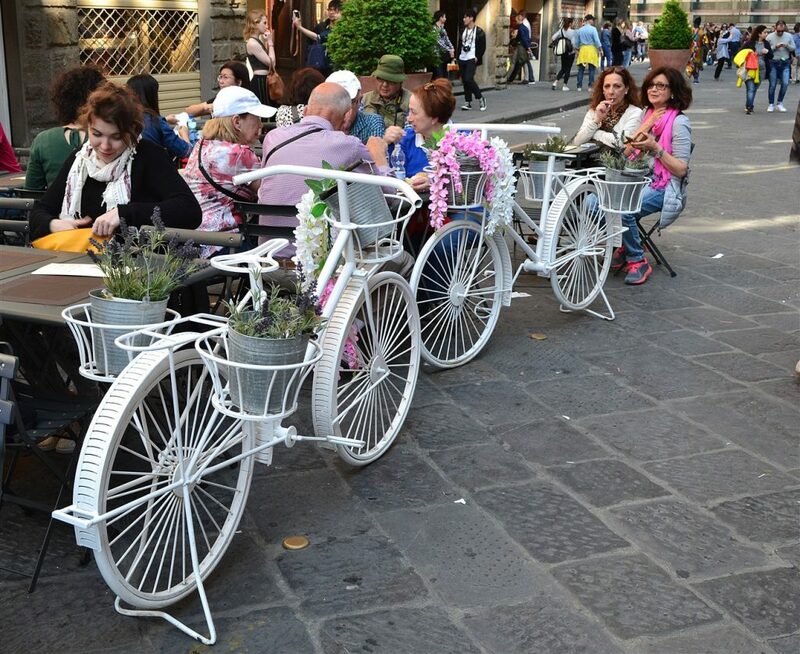 Yes, Florence is crowded, sometimes annoyingly so, and yes, it can be touristy and not cheap (though we didn’t find it any more expensive than Rome). Doesn’t matter. Florence is stuffed full of beautiful historic churches and cathedrals, hidden streets and lanes to wander, lavish palaces, and more famous art museums and galleries per square foot than anywhere in Europe. 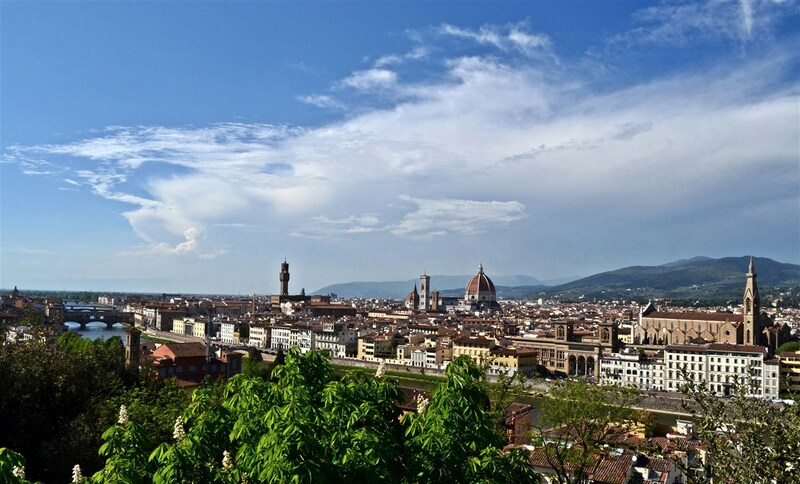 Florence is a city of approximately 380,000 people but it feels smaller, especially going there directly after Rome. 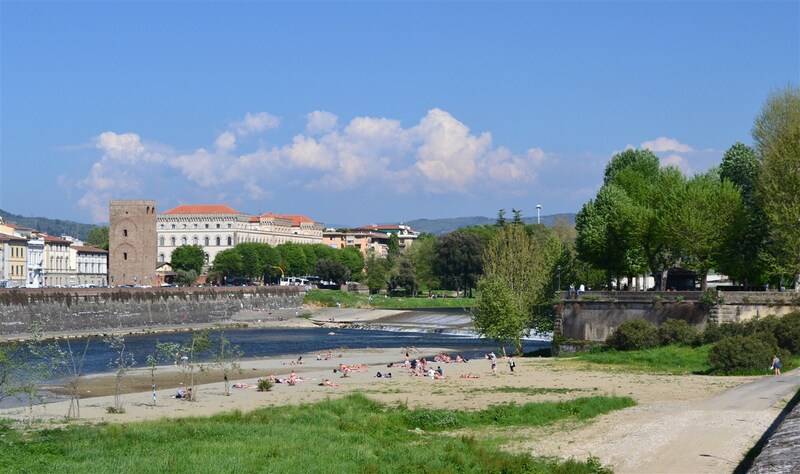 The center of Florence, containing all the major sights and attractions, is very compact and easily walkable. One main reason for this walkability is the LTZ, or Limited Traffic Zone. Motorized vehicles, with the exception of taxis and business delivery vans, are prohibited within this zone which encompasses the heart of the city. After putting our lives on the line every time we crossed the streets in Rome, it was a joy to stroll Florence without constantly looking over our shoulders wondering when we would be squashed by some crazy driver. 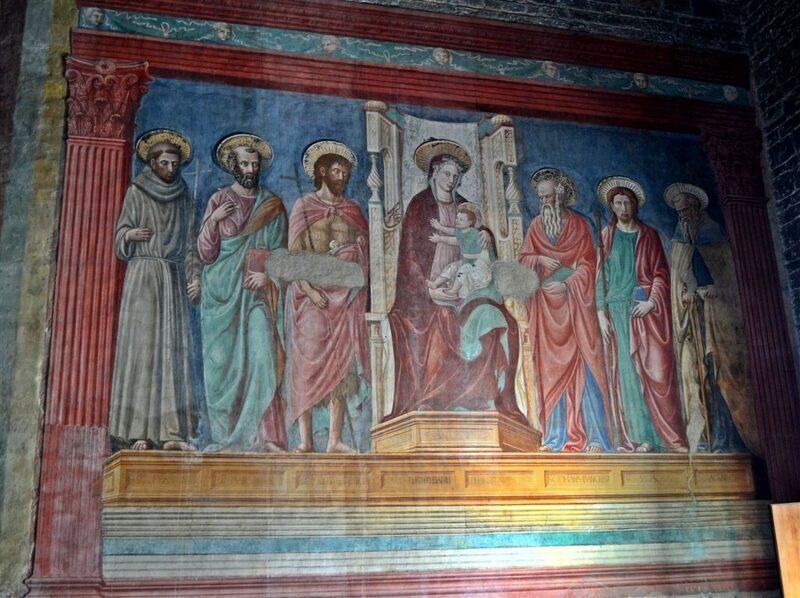 The history of Florence could easily fill dozens of volumes in the history section of any library, especially as it relates to the Middle Ages and the Renaissance. 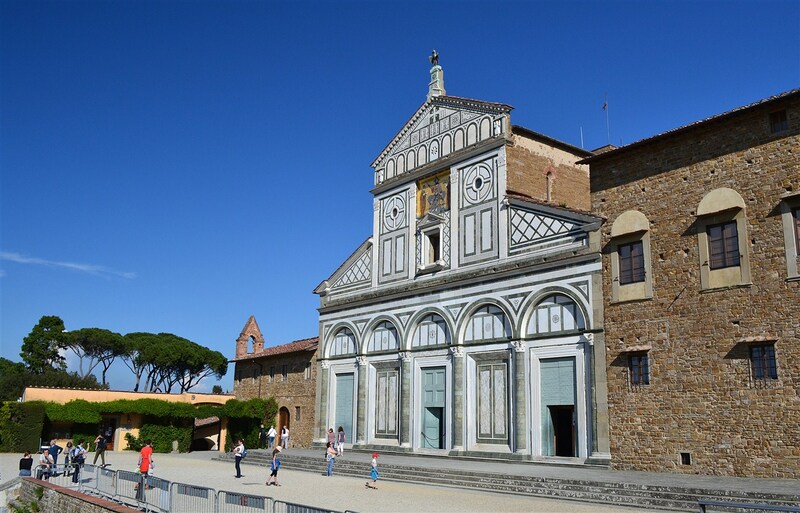 As this is a travel article and not a historical one, suffice to say that without Florence (and the Medici’s) there would have been no Renaissance. 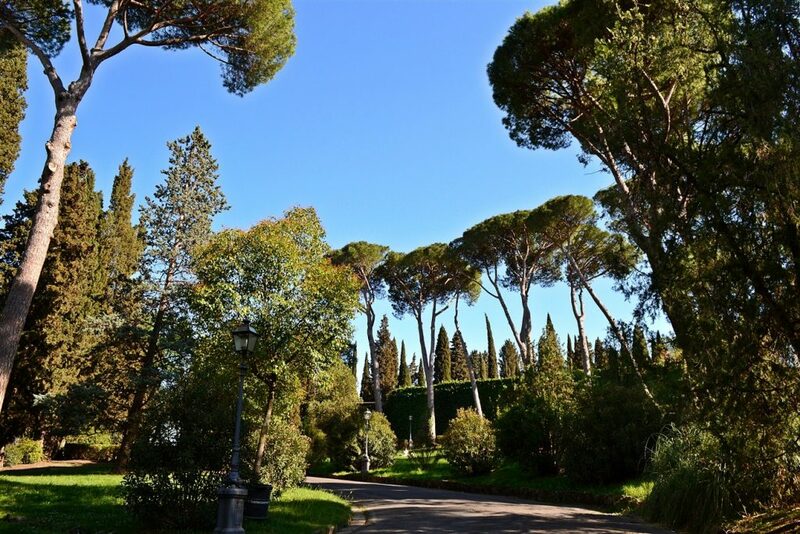 The influence of the Medici family on this era and their patronage of so many of the greatest artists cannot be overstated, including such names as Leonardo da Vinci, Michelangelo, Boticelli, Raphael, Donatello and many more. Politically, economically, and culturally Florence was the most important city in Europe and probably the entire world from the 14th to 16th centuries. The best part of all this for the modern traveler is that a vast majority of the art created during this period still resides right there in the many museums and galleries and plazas scattered around the city like jewels awaiting your inspection. We were fortunate enough to visit several of them during our stay and I’ll be covering that in detail in subsequent articles. As mentioned earlier, one of the great joys of being in Florence is simply getting out and walking the streets and neighborhoods of the city. 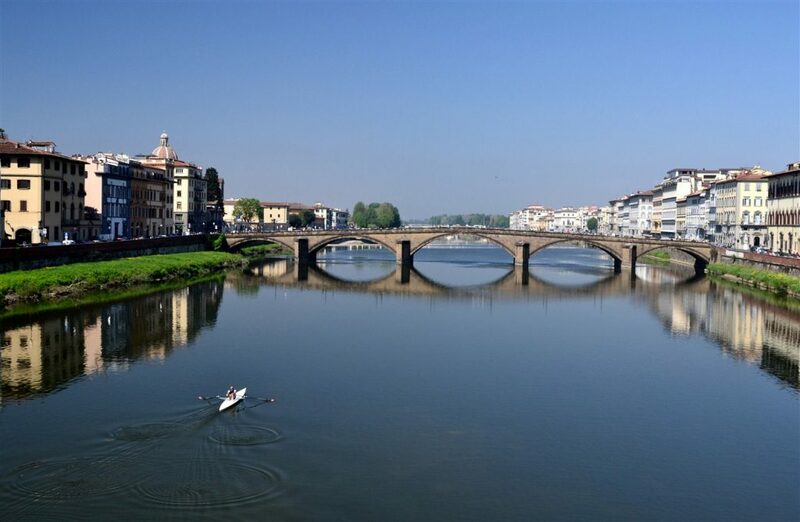 There’s no better place to start than the famous Ponte Vecchio (which simply means “old bridge” in Italian) spanning the Arno River and linking the center of town north of the river to the Oltrarno neighborhood on the south bank. Ponte Vecchio was the first bridge over the Arno. 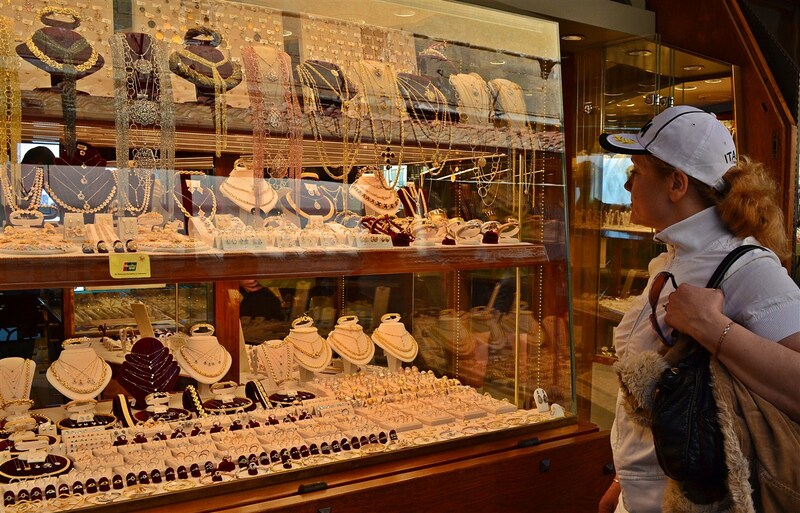 Its most striking feature is the multitude of colorful shops (most of them gold and jewelry establishments) built on its edges. 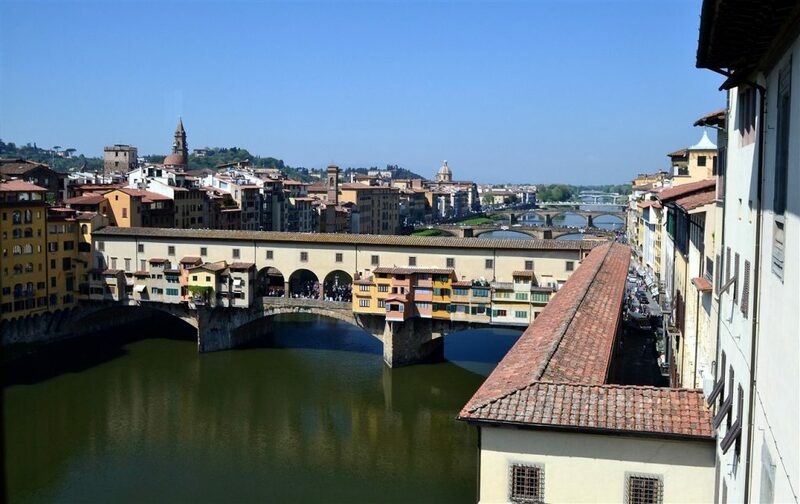 The bridge also carries an elevated corridor (closed to the public) built above the shops, linking the Uffizi Gallery to Palazzo Pitti, which was the official residence of the Medici family. Seems they didn’t want to rub shoulders with the common riff-raff when crossing the bridge – not to mention a healthy and well-founded fear of assassination – so they had the elevated walkway constructed for their own personal use. 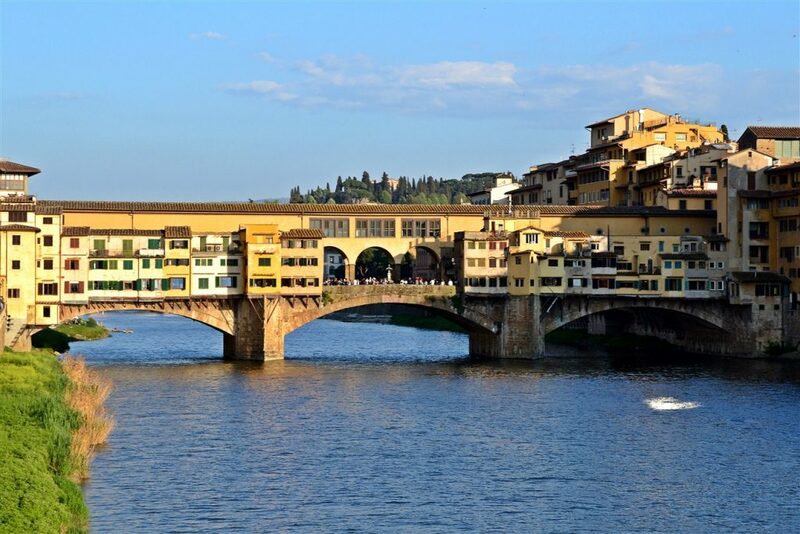 Ponte Vecchio is also the only bridge in the city to have survived World War II intact. It was slated for destruction along with all the other bridges by retreating German forces but spared at the last minute by the German general in charge after he was convinced of its historical value by a local consular officer. Since our hotel, the Alessandra, was located literally around the corner from Ponte Vecchio, we spent a lot of time in this area during our stay. The bridge itself is immensely crowded any time of day but still a fun place to experience. There’s almost always some street musicians playing and these aren’t your scruffy panhandler type buskers typically encountered in the U.S. In fact all the street performers we saw in Italy were professional quality musicians and well worth a stop to listen and toss a few coins in their basket. I also want to give a quick shout out to our hotel Alessandra and their tremendous staff. No, they’re not paying me to say this (maybe they should) but of all the places we’ve ever stayed (not just in Italy) they were the friendliest, most helpful group of professionals we’ve ever encountered. They made our stay in Florence a true pleasure. When Irina became ill on our second day they went above and beyond to do everything they could to make her comfortable. 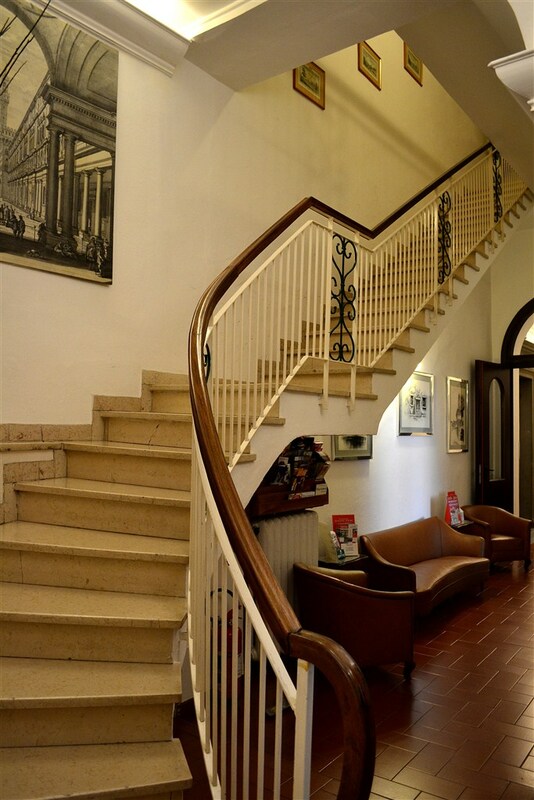 The bonus is the hotel itself is in a lovely older building with high-ceilinged rooms of real character, yet with all the modern amenities. I recommend them to anyone. Due to my wife’s untimely illness and her being bedridden for a day and a half, it quashed our plans for a day trip to Pisa and left me with a lot of time on my hands. I offered to stay in with her but she kicked me out. Honest. 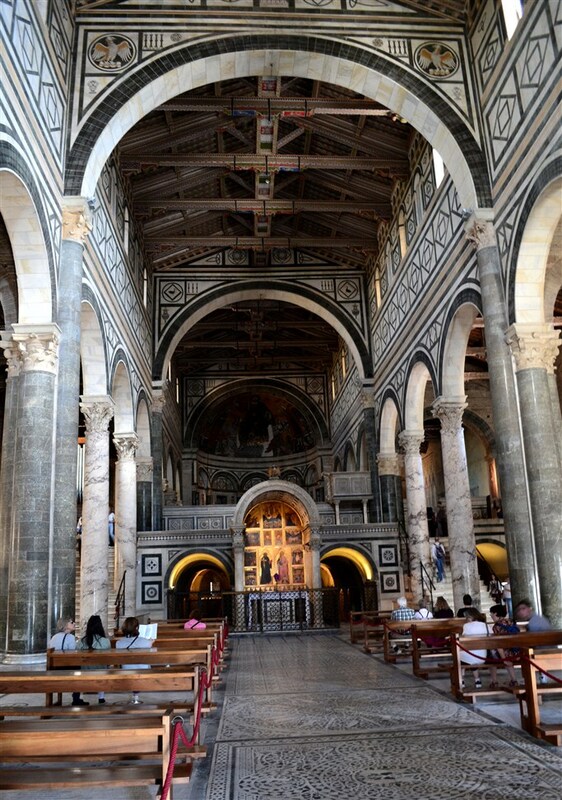 So I climbed to the top of the Duomo and also its Campanile, or bell tower, two things she wouldn’t have done anyway, took lots of photos and went on several walks around town. 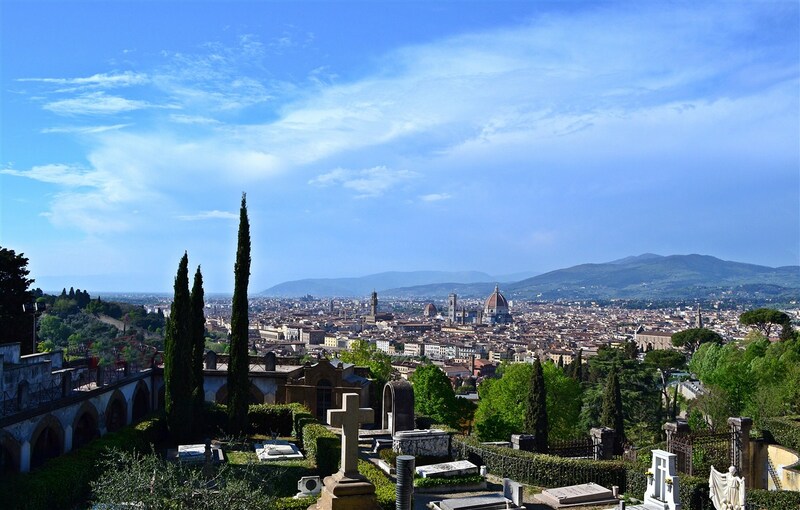 The best of these was a walk along the south bank of the Arno and up the hill to Piazzale Michelangelo, the best vantage point to view the city and the spot where everyone gets those spectacular postcard-ready shots of Florence. So I got mine, too. 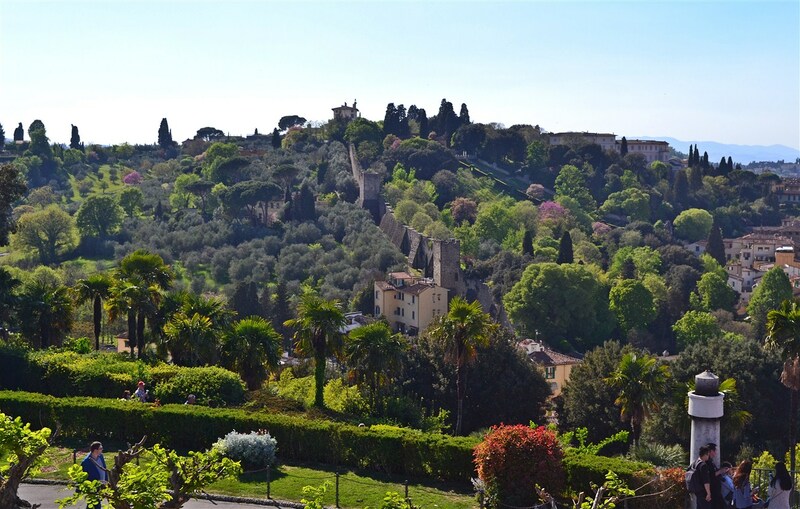 If you’ve already made the climb to Piazzale Michelangelo, when you’re finished there continue up the hill about another quarter mile to San Miniato al Monte church. This affords you another sweeping panorama of Florence from a slightly higher point and also the opportunity to stop in and check out the church itself, considered by many experts to be Tuscany’s most beautiful Romanesque style church. The facade is a model of understated elegance and the interior is just as dazzling. 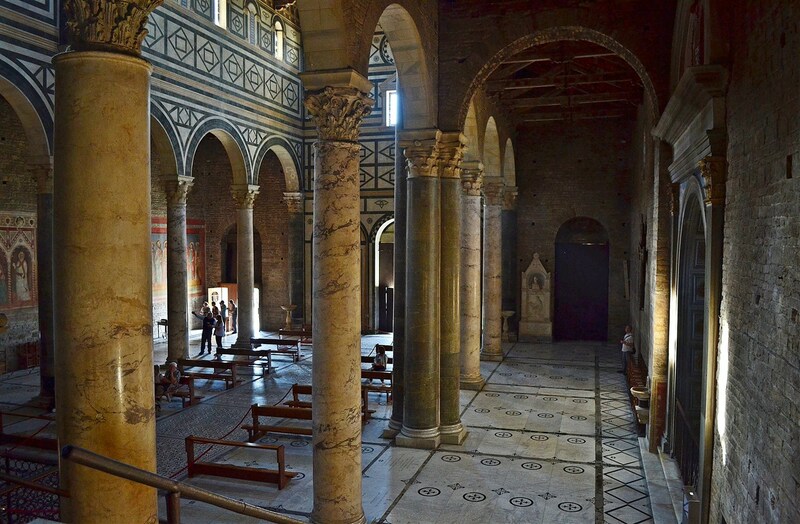 Much of the three-tiered interior is unchanged from a thousand years ago, featuring inlaid mosaic pavements and columns and pillars salvaged from Roman and Byzantine buildings. Outside there is also a church cemetery of interest in front and off to one side. 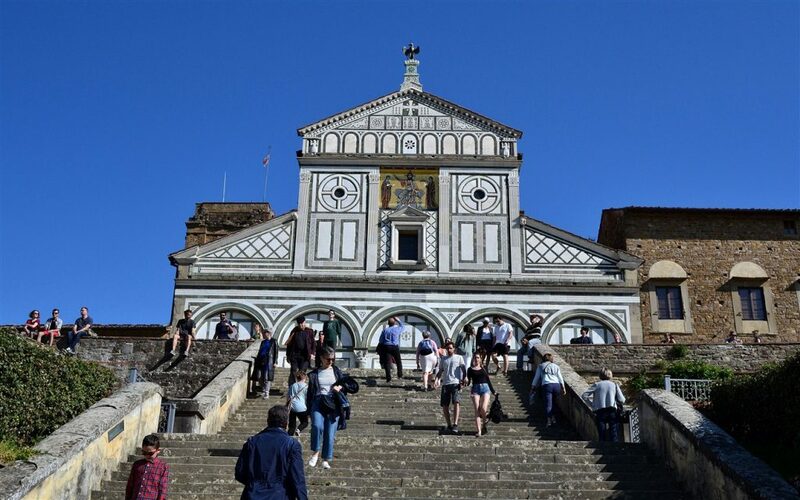 All in all, San Miniato is the best place to view the city and grab some great photos while also catching some quality church art. Don’t miss it.